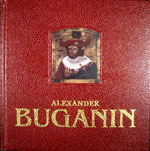 In "Alla Bulyanskaya's Gallery" you can get books on art, albums, catalogues, bookslets, posters and cards of our leading artists. Information of price, presence of printed production, you can get in gallery branches in Moscow and London. 78 pages, 64 colour Illustraitions. Moscow – St. Petersburg, 2001. 182 pages, 157 colour Illustraitions. 70 pages, 65 colour Illustraitions. 74 pages, 65 colour Illustraitions. Arists of «Sangat» gallery. Ufa. of spiritual and sensual life). 83 colorful illustrations with commentary. 112 pages, 97 colour Illustraitions. Graphics (water colour and books illustrations). 146 pages, 129 colour illustrations. Album "Pictures with "Abbey Road""
Kasimir Malevich. Konstantin Rozhdestvenskiy. Gleb Bogomolov. 142 pages. 77 colour illustrations. 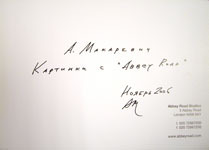 A joint venture between "Alla Bulyanskaya Gallery" and the collector Valeri Jerlitsyn. Moscow - London "Black Quadrat" 2005.